The mechanical keyboard community rocks! If you’re on top of all the Wooting news, then you’ve seen the latest 3D renders blog. `Of course, we’ve shared these render with the mechanical keyboard community; to be either slaughtered by trolls or survive with dignity. Besides the blog, we’ve posted the 3D renders on Imgur, shared it with Reddit and updated Geekhack. Thankfully the mechanical keyboard community is extremely friendly and not afraid to give honest opinions; we survived it with not only our dignity but also slight praise for our work. If that isn’t a confidence boost, then we don’t know what is. Of course, a feedback session isn’t without some points of attention. Let’s start with an FAQ before jumping into the user feedback. What material is the top plate made of? The top plate is made from aluminum, and the Wooting logo on the front of the keyboard is engraved into the aluminum. It’s possible to (sandblast/brush) anodize the plate in different colors. At this moment, we haven’t narrowed down our color palette for the keyboard, but it’s safe to assume that we’ll be sticking with a black color palette first. There are plans in motion to make the top plate with different colors available in the aftermarket. In the further feature, we’ll be able to produce the entire keyboard in other color variants. Will you release an ISO version? At launch, we will have both an ANSI and ISO version available. We are only not able to promise the correct keycap legend layout for your designated country. In other words, the legends will not feature special Scandinavian, German or other particular legends. Is the keyboard fully programmable? Full programmability is in our plan, this doesn’t mean you will have to make use of the feature. We first aim to provide all basics and unique features out of the box, without limiting the access to it. As we progress we’ll release more features that will also allow full programmability. A very debatable topic. Compared to our first version, we switched from mini-USB to micro-USB. Only not everybody agreed with our decision. Since many mechanical keyboards support mini-USB, many users have mini-USB custom cables and believe that micro-USB is easier to break. We understand why the were arguments made, but we’re sticking with our choice to go with micro-USB. The micro-USB connector basically has better durability and is more widely available than its mini-USB predecessor. If it was a feasible option, we would go with USB-C, but it’s just too early. Actually, this is not the case. We’ve designed a special clip style cable gutter that should fit a big array of cable types. Besides, we’ll provide a braided cable which in itself is already thicker than standard. Once we’ve got the prototype keyboard ready, it’s one of the first things we’ll be testing. Previously, we received the same feedback; that time we looked into it and tried to change the design without breaking its signature look. Then we took a look if in theory it would cause any problems with wrist pads, and we concluded that it’s unlikely, but we’ll never know for sure until we’re able to test it out with the prototype. 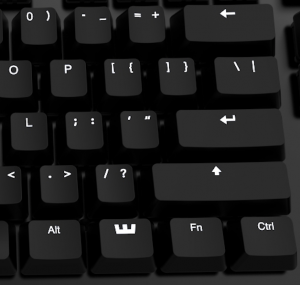 If you look closely at our modifier keys, you will notice that we’ve used text for Alt, Fn and Ctrl but icons for Enter, Shift, and Backspace. 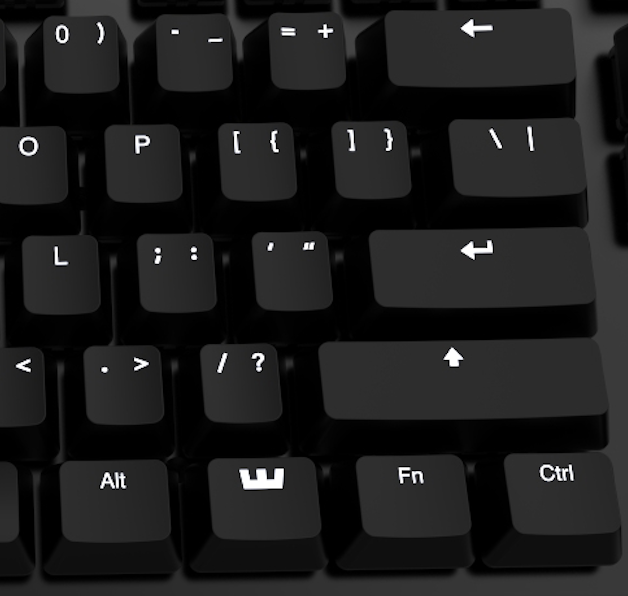 A couple of users suggested we should also replace the text with icons, such as Alt and Ctrl. We haven’t decided just yet, what will be best, but we’re playing around with it. It’s an interesting solution, that we haven’t seen done for a while anymore. Unfortunately this change will be too big, and is yet to unknown to consider at this point. We want to thank everybody for their time, we really appreciate the feedback/input and hope you’ll keep giving it. Just one small favor. We want to up our game on Facebook, so if you can head over there and like our page, that would be amazing.